The Fort Collins Symphony is the oldest arts organization and the only professional symphonic orchestra in Larimer County. For more than 60 years, the Symphony has enriched lives and shaped the musical landscape of northern Colorado, serving as an enduring cornerstone of our community’s cultural foundation. To perform spectacular live orchestral music and host educational events as a means of inspiring, bringing joy and providing an environment that is entertaining, nurturing, and inclusive for all residents of and visitors to Northern Colorado. The Fort Collins Symphony will continue to be a source of community pride as the leading regional orchestra with an expanding audience while achieving a national level of artistic excellence. It began in 1948, when a young violinist named Will Schwartz came to Fort Collins from New York City to become a professor of music at Colorado A&M College, now Colorado State University (CSU). Fresh out of Julliard, Schwartz eagerly took the helm of the small Fort Collins Concert Orchestra, formerly led by Mrs. Warren Leonard from 1923 until the late 1930s. Maestro Schwartz held his first Fort Collins Symphony rehearsal October 5, 1949. Schwartz’s talent and reputation quickly grew the volunteer ensemble, which at the time consisted of college students, teachers and other community members. In the decades that followed, Maestro Schwartz earned the Symphony respect, recruited extraordinary talent, and inspired a loyal following – a legacy that remains in place today. As the Symphony matured, additional support was needed to manage its professional growth. The Symphony Society Board of Directors, now the Fort Collins Symphony Association, was formed in 1952 to provide programming guidance, personnel management and fiscal oversight for the organization. The Women’s Guild, now the Fort Collins Symphony Guild, was established in 1963 to coordinate fundraising activities and special events for the Symphony. Clare Wilber was the Symphony’s first office manager in 1969. Since her retirement in 1984, a steady line of dedicated executive directors have worked to increase the Symphony’s accessibility and to strengthen its reputation through exceptional programming, nationally recognized competitions and meaningful educational opportunities. 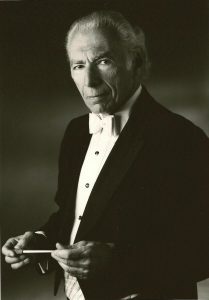 After 50 years behind the baton, Maestro Schwartz stepped down as conductor of the Fort Collins Symphony in 1999. Music director Fusao Kajima led the Symphony for the next two seasons. Then in 2003, the Fort Collins Symphony Association and CSU’s Department of Music, Theatre and Dance announced the joint hiring of award-winning conductor Wes Kenney. In the spirit of true collaboration, Maestro Kenney serves as music director of the Fort Collins Symphony, CSU Symphony Orchestra, CSU Chamber Orchestra and Opera Fort Collins. He also teaches graduate conducting at CSU, and appears as guest conductor for orchestras around the world. From its amateur beginnings in 1949 to the professional orchestra we see and hear today, the Fort Collins Symphony is regarded as one of the premier cultural organizations in the region and is poised to build upon this tradition of excellence for years to come.